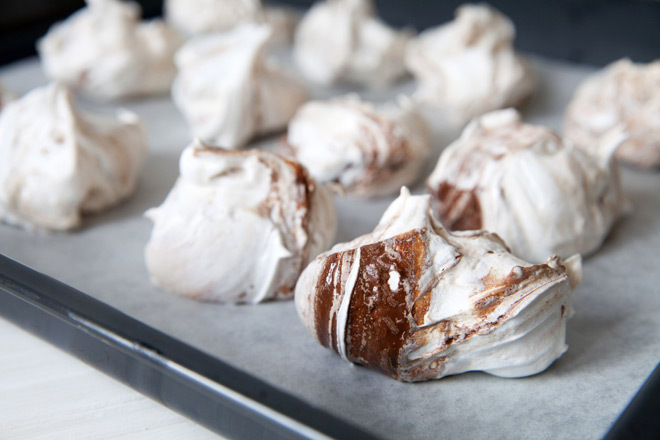 Light, fluffy and hard to say no to, a well made meringue is a treat indeed. All you need to do is perfect the art of whipping egg whites and these hazelnut and chocolate bites of deliciousness are yours for the baking. 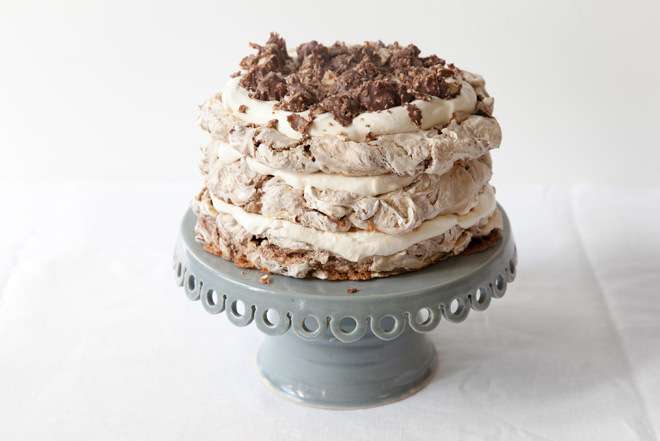 Alternatively, make a three layered meringue tower for a cake with a difference. 1. Preheat the oven to 180°C and line three large baking trays with baking paper. If you are making the cake, draw a 20cm circle in the centre of each baking sheet. 2. Spread the hazelnuts on a fourth baking sheet and roast them for 12 to 14 minutes, until browned. Let them cool slightly and then transfer them to a clean dish towel. Give them a good rub to remove the skins. Chop the nut and lower the oven temperature to 110°C. 3. In the bowl of a stand mixer fitted with the whisk, beat the egg whites with the salt at medium–high speed until soft peaks form. 4. Gradually beat in the caster sugar at high speed until stiff. Beat in the vanilla extract. 5. Fold in the hazelnuts and hazelnut syrup. 6. 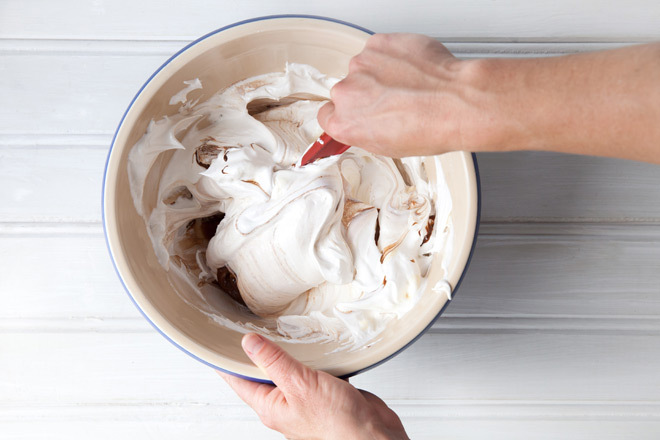 Pour the melted chocolate down the side of the bowl and gently fold in until the meringue is lightly marbled. 7. Spread the meringue mixture into the drawn circles and bake for 2 hours and 30 minutes, until crisp. Rotate the pans halfway through baking. Alternatively you can create individual meringues by simply spooning the mixture onto the baking trays in equal sized dollops. 8. 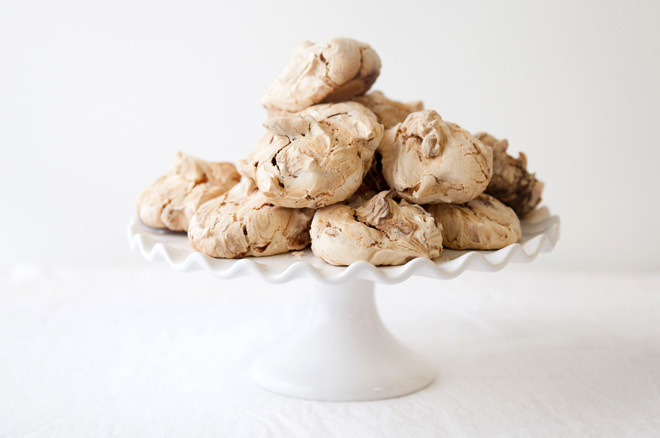 When they’re done, turn off the oven, leave the door slightly open and let the meringues cool completely. To create the cake, stack the big meringue circles one above the other, with a layer of whipped cream in between. Add a thin layer of cream to the top and garnish with crumbled Ferrero Rochers. Are you giddy yet with delight at this baking adventure? We think we might just do the merengue for these meringues. With thanks to Jenna May Viney for the recipe and styling.